Florence's oldest bank has successfully been turned into the Bank of Florence Museum. It is also the oldest bank in Nebraska. It has an interesting history. In 1853 word was out that the area west of the Missouri River was going to become a territory, and therefore would be opened for settlement. This would offer untold of opportunities and enterprising men of the era would be the ones to take advantage of it. Iowa was already settled on its edges that had easy access from the great Mississippi and the Missouri Rivers. 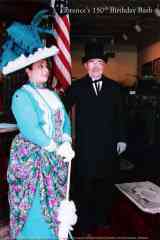 Davenport, Iowa was a community already well established with everything the community needed. Opening another bank there seemed pointless . . . but opening a bank west of the Missouri surely meant success. That is exactly what Cooke, Sargent, and Parker of Davenport had in mind when they came to the community that had everything going for it, Florence. It would likely be the capitol of the new territory, and the western terminal of the Mississippi and Missouri Railroad. There was even talk of a bridge being built across the Missouri River at Florence due to the river having a rock bottom, a unique feature not found elsewhere nearby. If a bank could make it anywhere, it could make it in Florence. A plot of land was secured, plans made, and the most important asset of a bank, a vault was ordered. The bank construction started in 1855 when the vault arrived from Pennsylvania. The walk-in vault was truly the start of the entire bank. It was set on a 3 foot thick slab made of mortared brick. The same amount of protection was built around the vault, three foot on each side and the top. Once the vault was secured, the construction of the bank was started. Also being constructed of brick manufactured in Florence, the two-story building stood out as the strongest building in the territory. Construction was complete before the year was out. The bank became official on January 18, 1856 when it received its charter. The upstairs portion of the bank was used as the home of the bank's manager, James Monroe Parker. When the bank was built, Nebraska was not to become a state for another decade so the bank issued its own money in denominations of $1, $2, $3, and $5. These type of bank notes became known as "wildcat currency." The bank funds were secured by loans, which worked fine until the Financial Panic of 1857, barely a year after the bank had opened. The bank made it for a while longer but finally had to close its doors somewhere between 1858 and 1860 at which time its owners returned to Iowa. Mr. Parker also ran a 600 acre farm just south of town in the area of Miller Park. When he returned to Iowa, his son stayed in Florence to manage the farm. The term "wildcat currency" was coined because the banks that issued money in this fashion were often way off the beaten path, so much that one person frustrated in how difficult it was to redeem the printed bill for silver or gold, quoted that it was easier for a wildcat to get access to the banks than it was for humans. At least that is how the legend goes. The bank building remained vacant for the next 30 years until it was started again in 1890 as a bank. The bank succeeded until the great depression of 1929, and even survived until 1936 when it folded once more. After the closing, the building was used as office space, a grocery store, an antique shop, a laundry and dry cleaners, and even an apartment building. Somewhere around 1904, the upstairs was turned into the offices of the Florence Telephone Company. Here, the switchboard operator connected lines together so the citizens privileged enough to afford their own "personal talking telegraph" could communicate with other Florence folks, and eventually, even outside Florence. Two-digit numbers and three to a party-line covered the entire community. 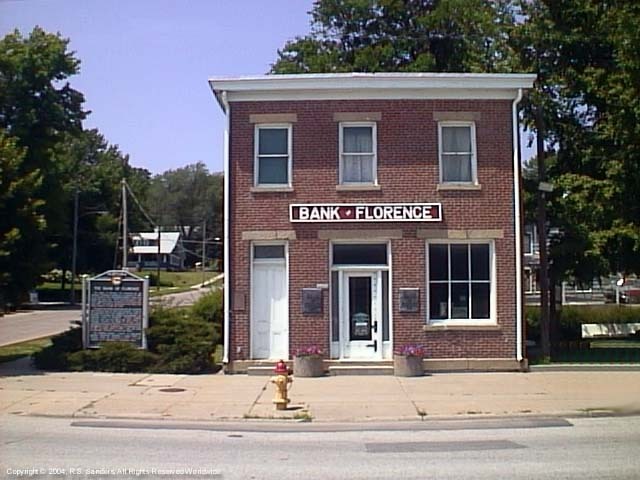 The bank building was passed down through family members of an early owner and bank planner, and eventually donated to the Florence Historical Foundation. After nine months, a lot of volunteer work, and donated funds worth less than "wildcat currency" during a depression, the bank was restored as a museum. The upstairs was restored as the home of the original bank manager. One portion was even restored as the Florence Telephone Company switchboard. After all these years, and all the other uses for the building, that vault never moved, and is still where they build the bank around it. It is understandably a favorite part of the tour for school children. Following Florence Days in May, the bank is open for tours: Open 11 A.M. to 3 P.M. Saturday and Sunday from June 1st through August 31st. Tours are available during the rest of the year by appointment. The tour is free but take note that there is a donation jar up front that holds anything from pennies on up, even "wildcat currency." Drop in what you can afford, it all adds up.